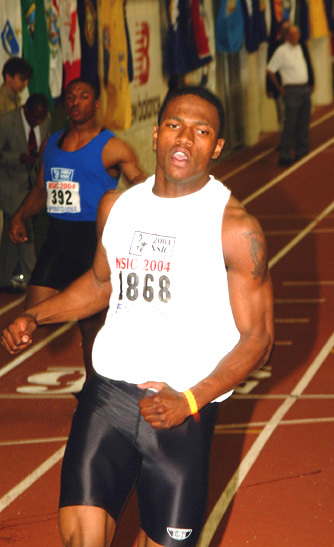 During Carter's junior year in high school he ran 10.38 seconds in the 100m sprint, 20.69 seconds in the 200m sprint and 45.88 seconds in the 400 meters, the best in the United States in that event for 2003. As a senior Carter ran 10.29 in the 100m sprint, 20.49 in the 200m sprint, and 45.44 in the 400m. He also set the national high school record in the indoor 200 m, with a time of 20.69, which is the first time any US in high school athlete run a sub 21 indoor 200m. At the 2006 NCAA Track & Field Championships Carter won national titles in four events and became the first person to do so since Jesse Owens accomplished the feat twice in 1935 and 1936. He was also the first athlete ever to win both the 100 m and 400 m events on the same day. Carter has become known as X-Man due to the first letter of his name as well as his signature victory salute of crossing his forearms to make an X. Shortly after his accomplishement at the NCAA Championships, Carter chose to forego his remaining 2 years of College and signed a 6 year contract with Nike. On July 11, 2006, Carter ran what was then the second fastest 200 m race ever, recording a time of 19.63. As of August 2013, that time makes him the sixth fastest man at the 200 metre dash ever after Bolt, Blake, Johnson, Dix and Gay. Carter's 2007 season was marred by a knee injury and it was not until the beginning of the 2008 athletics season that he fully recovered. Despite the recovery Carter was unable to quality for the 2008 Beijing Olympics. Unfortunately, his career has gone downhill from there because of numerous run ins with the law. He hasn't ran for a while and his sponsership is now over, as is his career it seems.